Bredagh’s U12 hurlers reached the final of the Division 3 of the North Antrim Indoor Hurling competition when they finished in the top two at Ballymena on Saturday 14 January. Bredagh were without half of their squad from last week and travelled with just the minimum of five players. It meant no subs but the boys played heroically, recording three wins, one draw and one defeat to finish second overall. They now play All Saints, Ballymena, who topped the group, in the final next Saturday. Cormac O’Rawe fired Bredagh into the lead. Joseph Hanrahan and Niall McFarland tightened up the defence while Cormac O’Rawe and PJ Lavery got on top at midfield. This allowed Sean Hughes to pounce for a deserved winner. Joseph Hanrahan excelled in the Bredagh goals and this spread confidence. Sean Hughes fired in goals from all angles finishing with two hat-tricks. Once PJ Lavery and Cormac O’Rawe clicked at midfield it left the way open for young Hughes to notch up another five goals. Sean Hughes expertly dispatched a Cormac O’Rawe pass into the Oisins net, however, despite inspired defending by Niall McFarland Glenariffe scored a late equaliser. Ballymena just edged this dress rehearsal for this week’s encounter. 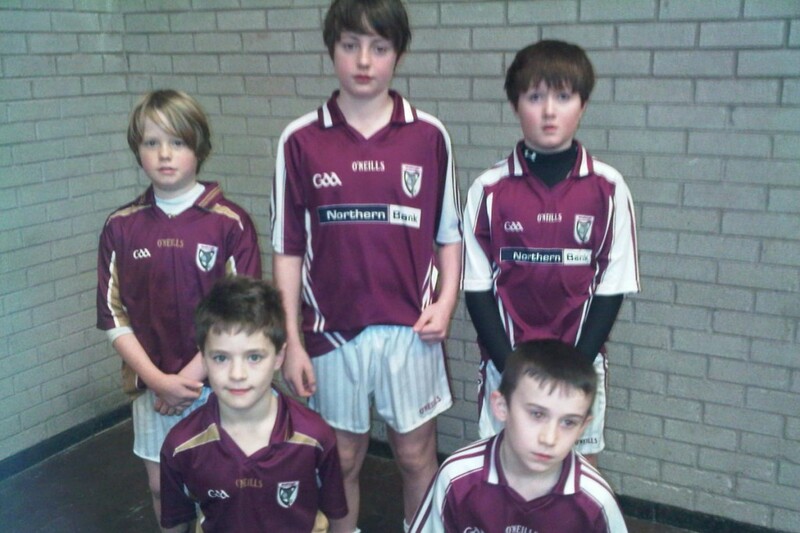 BREDAGH: Joseph Hanrahan, Niall McFarland, Cormac O’Rawe, PJ Lavery and Sean Hughes. The second Bredagh team were based in Coleraine and competed in Division 4. Odhran Davies quickly scored two goals before Coleraine replied. Davies then hit back to seal his hat-trick. Fresh legs in the form of Durkan and Maguire steadied the Bredagh lines and Durkan sealed a good win with a rasping shot. An early Emmet’s penalty was magnificently saved by McDonnell. However, a defensive lapse allowed Emmet’s to grab the first score. With strong support from Patterson, Kerrigan, Rainbird and Davies began to dictate the game and Davies eventually found the net. He quickly followed this up with another goal before subs Durkan and Maguire helped see the game out. The powerful Cillian Durkan hit the first for Bredagh before the fast moving Davies added a further two. After a bit of a rally from Stinson’s, Durkan then put in a great shift for his team with five goals overall. Great credit must also go to Patterson, Kerrigan and Maguire. Bredagh started well, with Mathew Rainbird unleashing an unstoppable shot to put his team 1-0 up. Durkan did a great job in midfield and added Bredagh’s second goal of the game. Sarsfield’s then threw everything at the Bredagh back line, but marshalled by Kerrigan and McDonnell there was no way through. Aaron Patterson won a penalty, which Durkan smashed home to see the game out. Particular mention must go to McDonnell in goals who was undoubtedly the best keeper on display. In the final match the boys quickly fell behind but they dominated the rest of the match with Davies and Durkan scoring one apiece to earn a deserved win. The team will play Sarsfield’s in the Division Four North Antrim final this week. Bredagh 2: Dylan Kerrigan, Evan Maguire, Cillian Durkan, Matthew Rainbird, Jacob McDonnell, Odhran Davies and Aaron Patterson.